FRP Hijacker tool was developed by Hagard to help and remove Samsung FRP locks for free. This latest FRP Hijacker By Hagard unlocks all the FRP locks of your mobile phone, within a few clicks. FRP Hijacker by Hargard also fixes soft-bricked devices without any issue. FRP Hijacker Tool By Hargard is a powerful tool that allows phone users to eliminate the FRP lock. This tool is used to remove all types of FRP lock. This tool uses phone dialer to bypass the Google account. ADB enabler and FRP remover feature make it very useful. This function is particularly useful if you are going to get rid of our mobile lock and want to protect all our private data. Free tool for all mobile phone usres. One tap FRP lock removal. Fix phone device software issues and errors. Support for Windows, Mac, and Linux PC. 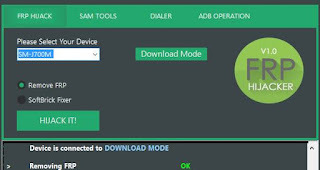 Download Samsung FRP Hijacker v1.0 from the given download link. Simply Run Samsung FRP Hijacker pc tool setup. Now continue the installation and finish the setup. Now you are ready to bypass Samsung FRP lock using all Samsung FRP Hijacker tool. Extract the FRP Hijacker Tool. Open "FRP Hijacker" main setup file. Select your Samsung Mobile device model. Connect your mobile device to your PC or Laptop via USB cable in download mode. Select Remove FRP and Click on "HIJACK IT!" button. There are many FRP Bypass Tools. FRP Hijacker is one of the best to get rid of factory reset protection lock. You can remove the lock within one tap. If you wish to download FRP Hijacker By hagard, then you can download it from the given link for free. Just tap the link and your download file start within a few seconds.